Kate Moss at Dior this morning, one may not have immediately noticed that the show’s true guest of honor had arrived. 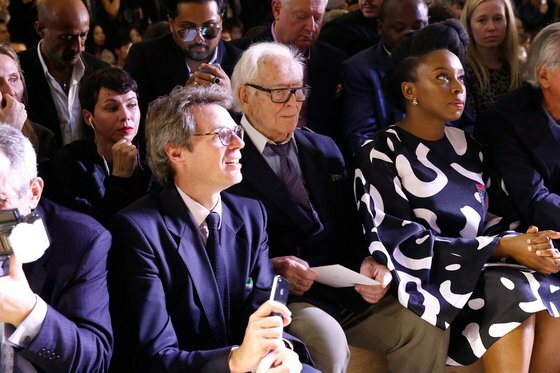 Quietly slipping past photographers, leading African author and modern feminist icon Chimamanda Ngozi Adichie took her front row perch alongside fashion power players. She, after all, deserved the perfect vantage point to see Maria Grazia Chiuri’s debut female-empowered designs for which she is very much the inspiration. The brand’s first female creative director in its 70 years sent her models gliding down the wood-planked runway to the sound of the Nigerian writer’s rousing manifesto. We Should All Be Feminists as they sported T-shirts that proclaimed the righteous statement. Beyoncé sampled it on her hit song “Flawless,” a smart signal of what Chiuri’s appointment will bring. Adichie’s appearance felt just as appropriate. The well-appointed writer has spoken often about her fascination with fashion, possessing a love for prints she showed off today in droves. She donned a long-sleeved sculptural frock splashed with a monochromatic graphic pattern and accessorized with a pair of green and magenta shoes that matched the colorful patchwork pockets of her dress. It delivered as strong a message as her words.